The love and friendship Sisters share never goes away; celebrate this union by giving all of your Sisters these Sister Personalized T-Shirts. Our Sisters Persoanlized Shirt is Available on our premium white 100% cotton T-Shirt, machine washable in adult sizes S-3XL. Custom Printed Sisters shirts include FREE personalization! 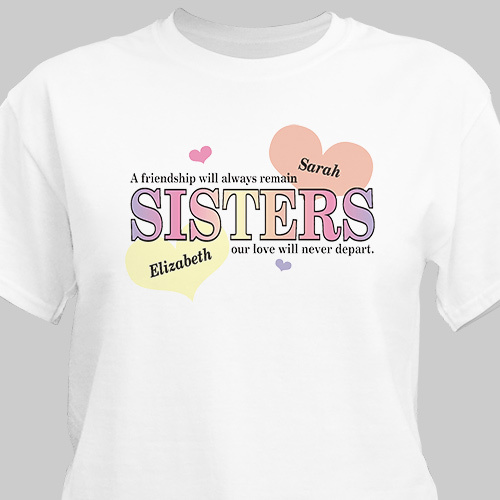 Each custom printed sisters shirt can be personalized with up to 12 sisters names with each sister in their own heart. These custom printed sister shirts make unique sister gift ideas.